Wikipedia defines Schadenfreude (pronounced shah-den-froy-da) as a feeling of joy or pleasure when one sees another fail or suffer misfortune. It’s a dark and heavy emotion, which can come in quite handy when attending the 50th birthday celebration of a friend:) I’m not a jerk, I’m just not 50 yet (but almost). 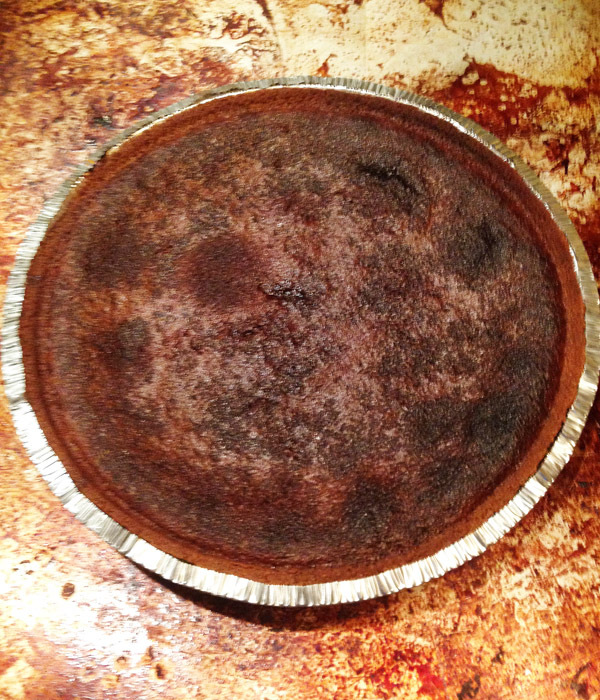 This is more of a savory pie, both dark and bittersweet, with quite a bit of heft. It’s both dense and heavy. Just like Schadenfreude. I attribute this pie to John Scalzi over at Whatever. The original posting is from 2006 and sent along to me by Alicia:) Thank you. 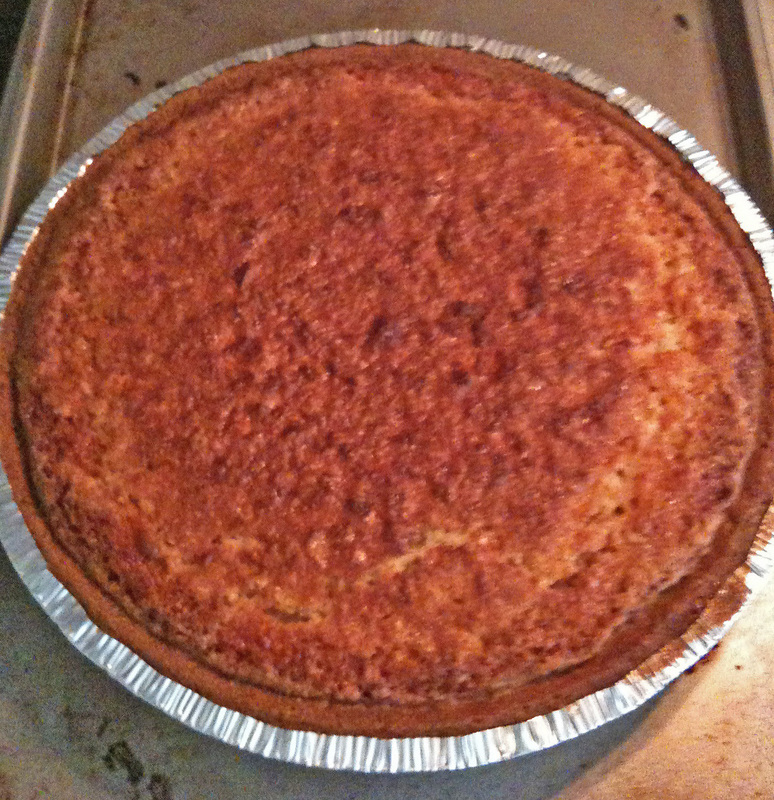 Pre-made 9 or 10 inch graham cracker pie crust. I recommend 10 inch as you will have leftover filling if you choose the 9 inch crust. Dark, heavy, bittersweet and tasty. Suffer, you! Pre-heat oven to 375 F. In a large mixing bowl add melted butter, corn syrup, molasses, brown sugar and cinnamon. Mix well. Melt chocolate and blend into syrup mixture. Add eggs and coffee liqueur; blend until mixture has smooth consistency. Pour mixture into your pie crust. Smile in sinister fashion. Place on center rack in oven, bake for about 45-50 minutes. At 45 minutes, poke pie with butter knife. If it comes out clean, pie is ready; otherwise give it five more minutes. Once pie is out of oven, let it set about 20 minutes if you are desiring to eat right away. When I took it out of the oven, it actually looked like it was breathing. It freaked me out a little. John’s rec (and I agree) is that this be eaten in small slices. It’s really rich and very heavy, and you’ll regret eating a large slice. And this would make me happy:) Have with a scoop of ice cream or a large glass of cold milk for maximum joy. A couple of weeks ago, I was in a Dollar General Store. Dollar General has all kinds of discounted stuff; housewares, furniture and (surprisingly good) food. While I was perusing snacks for the kid’s school lunches I found brand-name, pre-made graham cracker pie crusts. 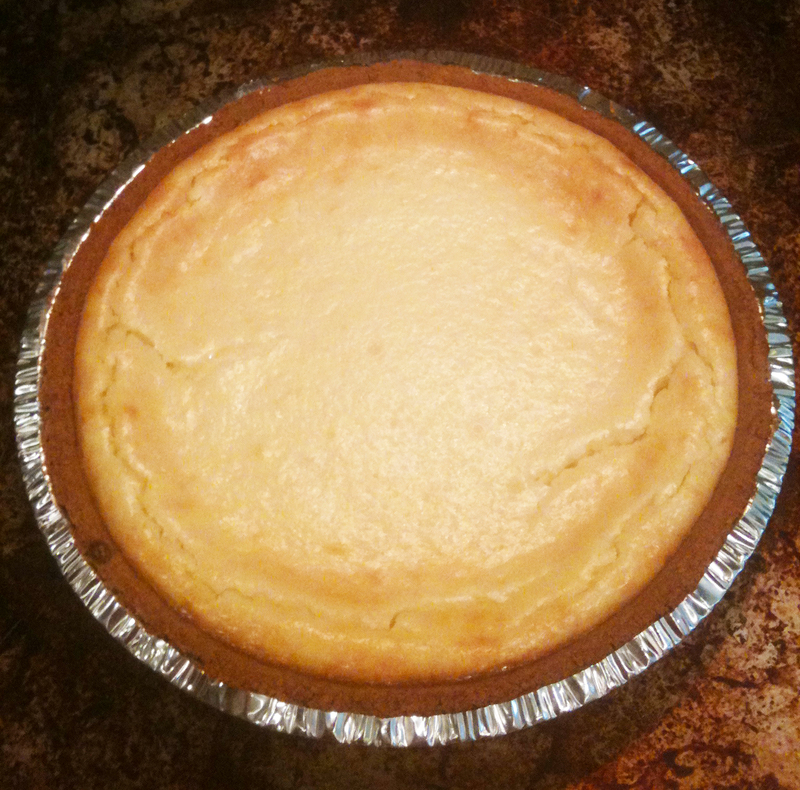 As I stared and thought about what I could do with them, an elderly woman approached me and said, “you could use those to make the worlds easiest cheesecake pie.” An easy cheesecake pie? Do tell! Cheesecake pie, it’s what’s for breakfast. Pre-heat your oven to 350F. In a large mixing bowl and using a hand mixer, blend the cream cheese and sugar until smooth. Add eggs, one at a time, and don’t overblend. Pour cream cheese mixture into your pie crust. Bake for 30 minutes or until the top is slightly golden brown. The filling will be puffy and a bit jiggly but it will fall and settle as it cools. Allow to cool completely and refrigerate for a couple of hours. Serve plain or you can add any fruit, or even chocolate, topping. I had a slice for breakfast and all I can say is, should you decide to make this, all will be right in your world:) And thank you, wise woman in Dollar General! 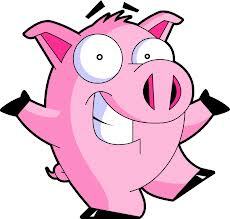 This recipe is a combination of 2 different recipes with elements coming from the Bacon Goddess and other elements coming from the Baby Screamin its Head Off in the Middle of the Night and Ruinin my Life Pie, which is also posted on my blog. This was created for a Friday afternoon gathering at my place of employment. It went over well. I’m not going to pull your leg, this is damn good. Pre-heat your oven to 400F. Cover a sheet pan in tin foil. Lay out the strips on your sheet and make sure they aren’t touching. They’ll stick together and won’t cook. Bake it 15-20 minutes or until it looks crisp. Remove from oven and place on a plate with paper towels on it so it can cool and crisp. Once cooled, put it into a food processor and pulse it a couple of times so you have your crumble. Set aside. Set your bacon grease aside. You’ll need it for your crust. Set oven to 350F. Liberally grease a 9 inch spring form pan. Break up your graham crackers into food processor and blend until fine. Add sugar and mix. Add melted butter and bacon grease and blend until it looks coarse. Add bacon crumble and pulse until blended. Dump your mix into spring form and press along bottom and up the sides a bit. Place on center rack of oven for 8-10 minutes. Keep an eye on it, you don’t want to burn it. Remove from oven and let cool completely. It should be cooled by the time you’re ready to pour the filling. In a large mixing bowl, blend your cream cheese until smooth. Add sugar and vanilla and blend until smooth. Add bacon crumble and combine. Add one egg at a time to your mix and blend just until combined. Don’t over blend, you get too much air in your mix and the cheesecake will fall. Add yolk and blend until combined. Scrape the sided with a rubber spatula and blend to make sure your filling is mixed well. Grease the side of your spring form above the crust line. Pour your filling into the spring form. On the bottom rack of your oven, place a pan with about an inch of water in the pan. This helps reduce the possibility of cracks in the side and top of your cheesecake. Place your cheesecake on the rack above the water pan. For the results I got, bake for 42 minutes at 350F. 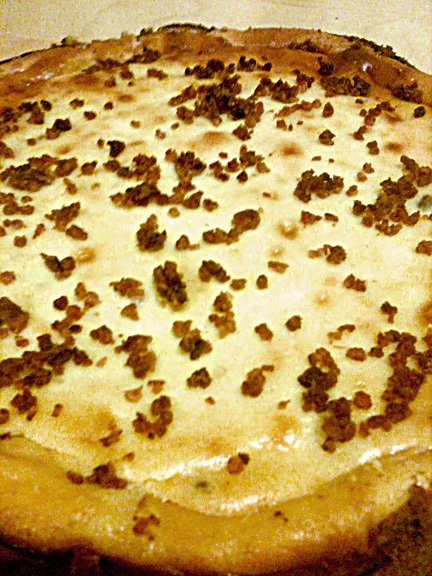 At 42 minutes, open your oven, take your remaining bacon crumble, and spread evenly over the top of the cheesecake. Put back in oven and bake an additional 3 minutes. 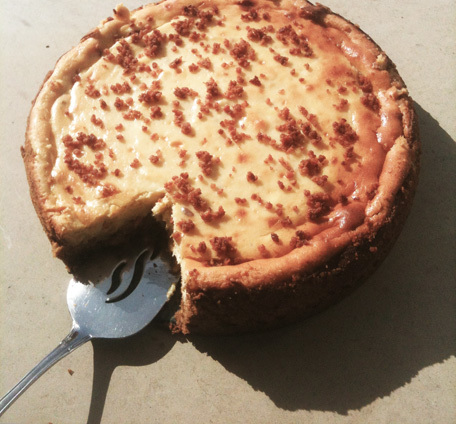 By now, your cheesecake should be a golden brown around the edges. And so today is 9/11/2011. Ten years ago I worked at an ad agency called Foote, Cone and Belding. On that day, as I was getting ready for work, I checked my email and a friend had just posted an email to our email list. It said simply, “Plane hit WTC. On fire.” I turned on the TV and couldn’t really process what I was watching. My first reaction was “is this some kind of joke?” I called a co-worker and asked him if he was watching TV. He handed the phone to my boss who told me that the office was closed for the day. I watched everything unfold and then rode my bike into downtown San Francisco. It was practically empty. I just sat on a bench on Market Street, took in the mental pictures of that day, where I was, and tried to rationalize. No rationalization came. Still hasn’t. I find that after 10 years there’s still a lot of things I can’t watch in relation to the attacks. It’s still upsetting, unnerving, unsettling. It was one mindf*ck of a day. And so much has changed, on so many levels. On this anniversary, it is also week one of the NFL football season. So I’ve spent my day watching games, buying supplies for pie number 42 and typing this. 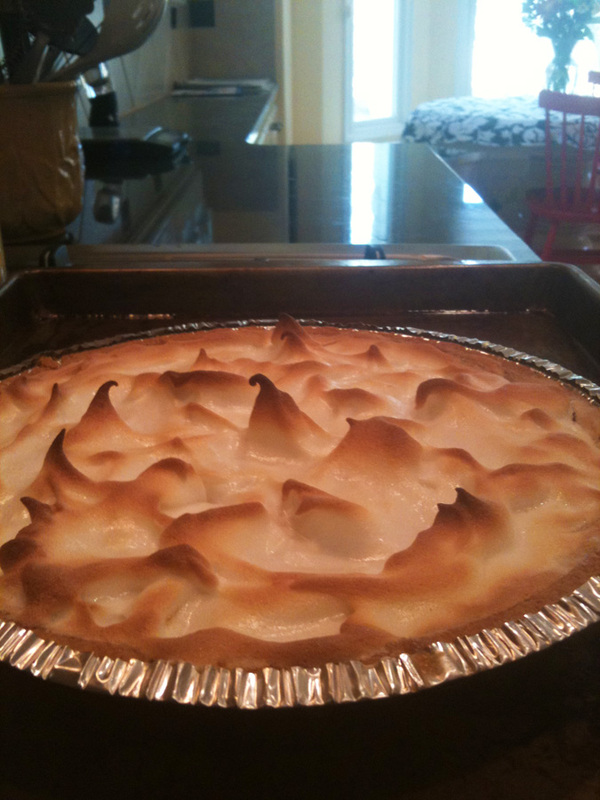 Today I made a butterscotch meringue pie. So much for low carb or vegan. The sweet is back. On the anniversary of a day that is anything but. This recipe can also be used (without the pie crust, of course) to make butterscotch pudding. Combine sugar and flour in the top of a double boiler. I used a glass bowl as the top of the boiler, with a spaghetti pot filled 1/4 full as the bottom. Bring water to a boil. Add remaining ingredients in order given, adding the water and eggs last. Mix the egg yolks with 2 teaspoons of water before adding. Cook until mixture has thickened and coats the back of a spoon. About 20 minutes. Remove from heat.Pour the mixture into a prepared 9-inch pie crust. Beat 3 egg whites until stiff. While beating, gradually add 6 tablespoons of white sugar, 2 tablespoons at a time. Beat well after each addition. Add 1 teaspoon of pure vanilla. 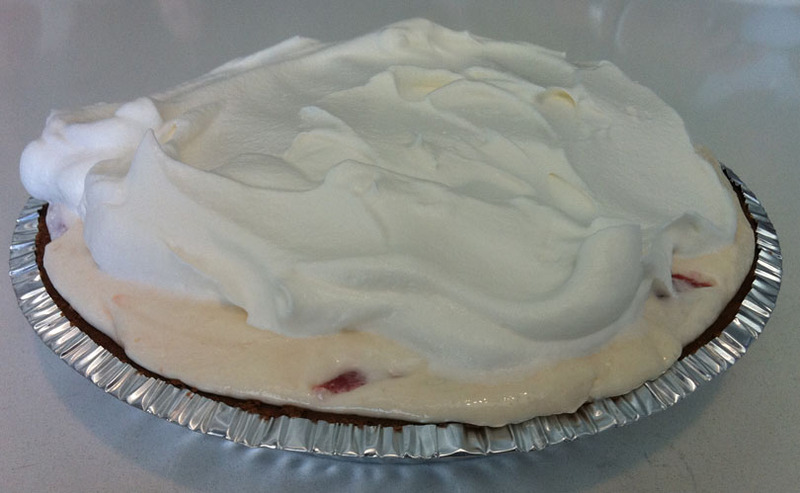 Continue to beat until stiff peaks form.Spread the meringue over the top of the pie, all the way to the edges. If you don’t spread it to the crusts to seal, the meringue may shrink. Put the pie in a preheated 375F oven until the meringue has browned. Let cool to room temperature. Eat and enjoy. The social committee at my place of employment decided that we needed to have a theme day at the office. Team spirit and all that. The Crew organized what is now dubbed in agency lore as “Wacky Watermelon Wednesday.” You could win prizes for your creations, which was enticing:) They had individual categories for taste, as well as presentation. So, I decided to partake in this wacky theme day and brought to work, pie 34, the Screwed Up Texan Creamy Watermelon pie. Actually, I brought in two pies. And I won a $25 dollar gift certificate for the pies! It’s baby steps on my march to Top Chef Desserts masterdom. This recipe is very simple and quick to make and is excellent on 100+ degree days, which we have a lot of in Texas right now. I attribute the recipe to Allie which I found on her site, Confessions of a Screwed Up Texan. Really good stuff. 2 cups of cubed or balled watermelon chunks. 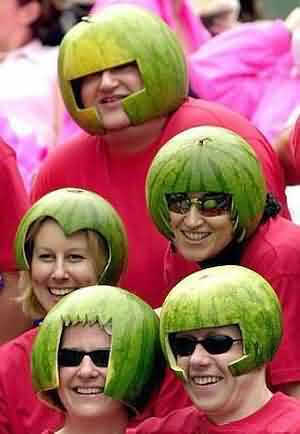 Seedless watermelon is the way to go. In a large bowl, whip the sugar, cream cheese, sour cream, heavy whipping cream, and (optional) food coloring together until smooth and fluffy, about two minutes. Using a spoon or rubber spatula, fold in watermelon. Spoon mixture into the prepared graham cracker crust and top with whipped cream. Chill for at least one hour if possible or just eat right away. Because I had to transport these from home to work, I didn’t spoon the whipped cream on the top of the pies until the contest Wednesday afternoon. It only added to the mystique:) The pie was very well received and I enjoyed it as well. The creamy mix and the texture and coolness of the watermelon worked very well together. The only downside for me was the pie “melted’ very quickly but no one seemed to mind. If you have leftover, it’s important to keep refrigerated. After last weeks unfortunate savory treat (which surprisingly the kids liked), I decided to make another sweet desert pie. On this lazy Sunday of daylight savings, it’ll be buttermilk pie. This is probably the easiest one I’ve made so far. No technique, just mix it up. This one comes from blogspot. In a large bowl, blend the butter, flour and sugar. Add eggs, vanilla extract and buttermilk. Pour into the unbaked pie shell and bake for one hour at 325 degrees or until knife inserted in center comes out clean. Cool and serve. I took this to some friends house for their 5 year olds birthday party and they were happy with the way it came out. It has a slight crunch off the top and then a nice gooey sweetness. The graham cracker crust adds to the texture in a very good way. It beats white cake with buttermilk frosting. Adopt a Siamese through Austin Siamese Rescue! The world needs more pie.